I have also been meaning to post this little note as a sort of historical reference for later. 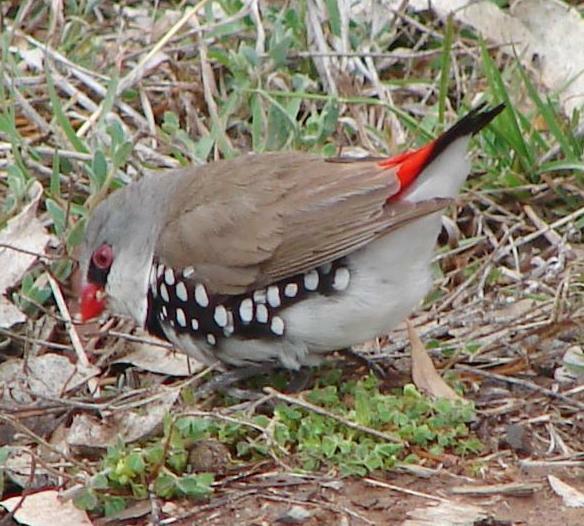 Back in February, most mornings, very early I would hear a low whistle which I know to be a Diamond Firetail Finch call. They were in the valley just over a kilometre away where there is a paddock, long grass, natural springs and creeks and lots of gravel which they really like. I’ve seen them there, happy and content. Well, that area was bulldozed late last year and totally cleared for development. Where did the Firetails go? I maintain that even though I never actually got to see one – I believe they were in the area. At least for a little while. Perhaps they heard the running water in the backyard. I sat out there a few times calling to them and something was calling back. I also entertained the idea that the guy over the back might have an aviary of finches, but I only ever heard them at a particular time in the morning and have not heard them for a week or so now.